Other forms of the drug: cream and ointment , tablets , spray . No full analogues. Other drugs for the treatment of fungus . The drug is applied once. Apply to both feet, even if the symptoms are present on one. Feet should be washed well with soap and dry thoroughly. The entire surface of the toes, the sole and the sides of the foot should be treated. No need to rub. Use a sufficient amount of ointment to cover the entire surface to be treated, usually 1 tube is completely spent on 1 application. Then let your feet dry for 1-2 minutes. You can wash your feet after 24 hours. 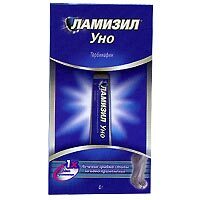 Lamisil Uno forms a thin, inconspicuous film, from which the active substance will penetrate into the stratum corneum within 72 hours. According to clinical studies, already 1 hour after application, 17% of the applied substance is found in the stratum corneum. And after 13 days, terbinafine is still present in the stratum corneum, at a concentration necessary to suppress dermatophyte fungi. With care: diseases of the liver, kidneys, neoplasms, alcoholism, endocrinological diseases. There is a lack of clinical experience in children, so at the age of 15 years the drug is contraindicated. Pregnant and lactating mothers are contraindicated for any drugs based on terbinafine, consult your doctor. Very rarely (less than 1 case per 10,000 patients): allergic reactions, rash, redness, itching. 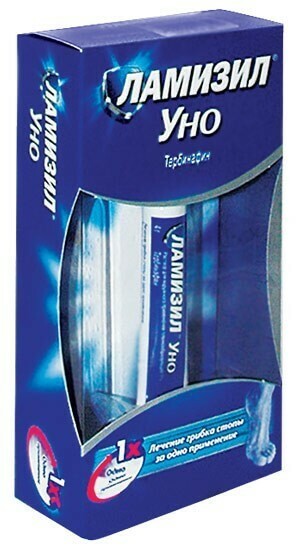 Rarely (less than 1 case per 100 patients) - dryness, burning, irritation of the skin. Transparent viscous substance, may be with a faint yellowish tinge, with a strong smell of ethyl alcohol. Ingredients: Terbinafine hydrochloride (1%), copolymer of acrylic acid and octylacrylamide (Dermacryl 79), medium chain triglycerides, hyprolose, ethanol. Fungicidal broad-spectrum drug. Violates the metabolism of fungi, causing their death. The metabolism of a person does not affect. Active against all dermatophytes, yeast, mold and some dimorphic fungi. Of yeast, good effect on Candida. Sold without a doctor's prescription. Shelf life is 3 years, at temperatures up to 30 degrees. In a word - a divorce for money. After 2-fold consecutive use in two months (after the first time I doubted the adequacy of the application) I realized that I was simply divorced. Maybe the drug and acts on a particular type of fungus, but not all and for one use, as advertised. Yes, and plenty of side effects. People! Do not believe the beautiful packaging and "persuasive" advertising, go to a specialist. Do not risk your health. He tortured a fungus on his feet, and Lamisil Uno just started advertising, decided to try. I used it once and really everything went away! For five years there have been no manifestations. Now again, somewhere I picked up this fungus, and accordingly I will buy the same drug. I highly recommend !!! Nonsense!!! Five years ago he was not even advertised !!! This does not mean that it was not. Yes, it did not go away, but for some time, the symptoms of the fungus were so infectious that they could not be completely cured, except for some cases, at the very initial stage. There is a need for constant prevention to avoid infection, and who has already caught this infection, then with the help of the treatment, the fungus should not be allowed to aggravate, and take deeper roots, the most unpleasant thing is that the fungus aggravates chronic diseases, if there is a person, and contributes to new ones, so disgusting - so disgusting. .In my family there was no fungus, and there was no such information as it is now, about this sore, people did not perceive it as a serious, poorly treatable disease, if my mom knew about it then it would be for me how to brush my teeth , but unfortunately, when I realized that it picked up the fungus it was already late, the disease had already developed, and the endless treatment began, now everything is normal, but I know that if I stop the prophylaxis, I will feel after some time and see the same symptoms, and it is a pity that there are very, very many such fungus-infected people. So that the parent , Keep the feet of their children, and teach your legs to personal hygiene, it is now necessary. Great drug. You just need to strictly follow the instructions and even spray the shoes so that there is no new infection. Terbinafin is a domestic analogue. About a hundred rubles.